In 1969 Robert Smithson visited the Mayan archaeological site of Palenque in Chiapas, Mexico. There, he stayed in an unfinished hotel in the small town with the same name. The ruined hotel impressed Smithson more than the archaeological ruins he had set out to visit. He made a series of photo slides that he then used in 1972 to give a lecture at the University of Utah in Salt Lake City. The lecture, which was recorded on tape, was conceived as a piece of art, something between a serious academic lecture and an ironic vacation slide show. Smithson used the chaos of the hotel as an analogy to the context of contemporary discourse of high art. Visual associations were made between elements found in the hotel and the work of his contemporaries: the texture of a doors in reference to the work of Jasper Johns, a pile of rubble to Robert Morris, concrete blocks to Donald Judd. While reading his text and using the slide show format, he was criticizing the discursive monopoly held by Minimal and Conceptual Art in the early seventies. 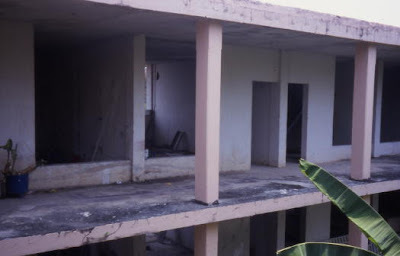 In 1999, I headed towards Palenque in search of any evidence of the existence of Smithson’s hotel. 31 years later, the hotel was still standing and retained its original name. Hotel Palenque had been continuously transformed, a second floor had been added and a new pool and buildings had been constructed. It still remained unfinished. 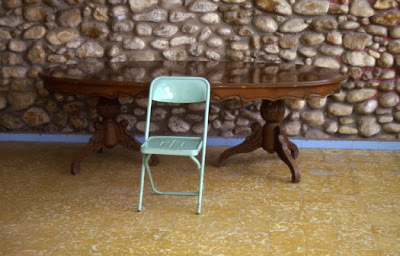 Tropical gardening, tawdry pavements, picture murals, monolithic benches, minimal doors, modernist furniture, and post-modern décor still lend themselves to picturesque analogies with the work of contemporary artists today. Built without any existing plan, the final form the hotel will take in case it is ever finished unknown. A work in process, it remains half finished, half ruined. Within it, different historical times and stages of construction coexist simultaneously. As a place in constant transition, Hotel Palenque has become a site of art-archaeological pilgrimage, a work of art open to future transformations, reconstructions, deconstructions and destructions. 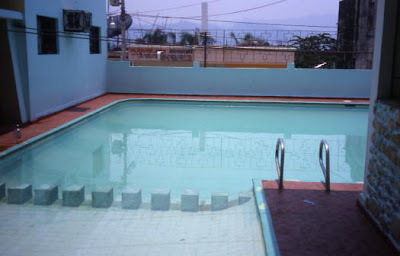 Hotel Palenque. Av 5 de Mayo No.15, Palenque. Restaurant, Bar, Pool, Parking, A/C, TV. tel. + 52 (916) 501-89 01.